via Pistachios Improve Metabolic Profile in Prediabetes. Beneficial Effect of Pistachio Consumption on Glucose Metabolism, Insulin Resistance, Inflammation, and Related Metabolic Risk Markers: a Randomized Clinical Trial. This study was funded by the Western Pistachios Association, now known as American Pistachio Growers (U.S.), and Paramount Farms. Hmm… The diets were isocaloric and matched for protein, fiber, and saturated fatty acids. But were the foods identical between the control group and pistachio supplemented group? Food preparation methods controlled for? Interesting little study nonetheless. In a food processor pulse the garlic until finely minced. Add the beans, lemon juice, oregano, thyme, and red pepper flakes. Pulse until the beans are well chopped. Add EVO in a thin stream and pulse until you have the consistency of a thick paste. Taste for seasoning and add your salt and pepper at this point. Transfer to a serving bowl and dust lightly with chili powder. Serve with chips or pita bread wedges. Every now and then you have to try something different. Instead of hummus I decided to make a white bean dip instead. Cannellini beans. I was headed down the usual path with the garlic, lemon, oregano and thyme. Most recipes suggest paprika to top the dip. I went to my spice cupboard to check the expiration date of the paprika. As I suspected, time to toss and buy some fresh paprika. One of the local stores has herbs and spices in bulk. The prices are reasonable, the quality is high, and you have to fill little plastic bags marked with a large sticker to identify the contents with the code for the cashier to use at check out. Well, I grabbed a small plastic bag from the spice cupboard, got a spoon and dusted the dip with the paprika I just bought. Sorpressa!!! It was chili powder. Tips – When you screw up like this don’t tell your guests. If they don’t like the dip, remove the dip, toss in the garbage and blame it on some old (fill in the blank). Hmm, you say. The paprika must be old. That’s what is throwing off the flavor. Go to your fridge, break out some cheese and nobody will really care. Now if your guests like the dip, of course, take as much credit as you want. via Crispy Black Bean Tacos with Feta and Cabbage Slaw – Bon Appétit. There are a bunch of clipped recipes in the cookbook holder by the stove. This Bon Appétit recipe has been there since 2009, February 2009 to be exact. We love this recipe for a quick and healthy meatless meal. Earlier today I glanced at the recipe to make sure all ingredients were on hand because you always have at least one ingredient missing. I just don’t want the missing ingredient to be missing after I start cooking. Wait a minute! This isn’t how I make this dish! OK, full stop. No more writing. I will make my tacos tonight and then write the recipe down. I’ve left the link to the original recipe. I was right. I make this dish differently than I did five years ago. So here we go. I also made some fresh guacamole and to be perfectly honest, the flavors are intense, the textures varied, and it…is…HEALTHY. Drain and rinse the black beans, set aside. In a small saucepan, saute the onion and garlic until soft. Add oregano, cumin, and garlic. Saute until the spices are fragrant. Add the well drained black beans. Add lemon juice. Heat until warmed through. Mash the beans with a spoon but leave it chunky. Season with celery salt. Set aside. In a medium mixing bowl, whisk the olive oil and juice of one lime. Season to taste with salt and pepper. Add a dash of sugar to cut the acidity if needed. Add the green onions, cilantro, and cabbage. Mix well and set aside. This recipe will make enough for 4-6 tacos. If you need more servings, double the bean recipe and buy more taco shells. You will not need to double the cabbage slaw portion. You’ll have plenty. Construct your tacos. Place some beans in the taco shell, followed by salsa, feta cheese, and slaw. If you are using guacamole, put in on your taco last. We recently discovered La Tiara authentic Mexican taco shells from Gladstone Missouri. Yeah, I was thinking the same thing as you until I tried these shells. Use fresh cabbage and not the bagged sliced slaw next to the bagged salads. In a pinch, go ahead and use the bagged stuff. But once you use fresh cabbage, you won’t go back to the bag version. This taco recipe is perfect for a Meatless Monday. May I suggest oven roasted sweet potatoes and corn for sides? via Going Greens: Edmond’s Upward Harvest lives the gospel of local, sustainable growing practices | News OK. I was at the market the other day and I saw potted plants strategically located throughout the fresh produce section. Why is the grocery store selling plants? Indoors, no less. I really didn’t give it much more thought until I stumbled across this article in the local paper. How cool is it to have an organic hydroponic farm in your town? Read the article and check out the video. Kind of makes the earthquakes bearable. 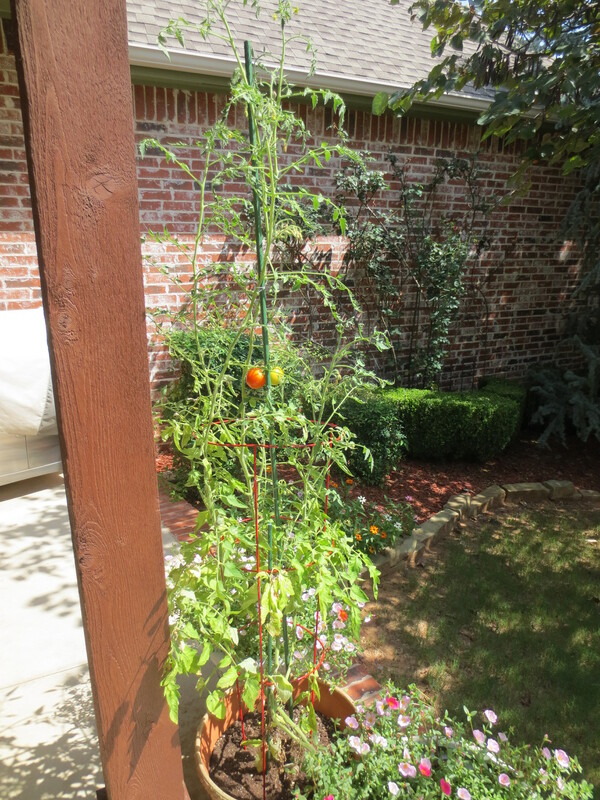 The tomato plant is now taller than me. Since the branches are heavily laden with fruit I have deployed my tomato plant stake. $12 juice? Sure, I’ll take two. via How High-End Juices Extract Money From Consumers – NYTimes.com. 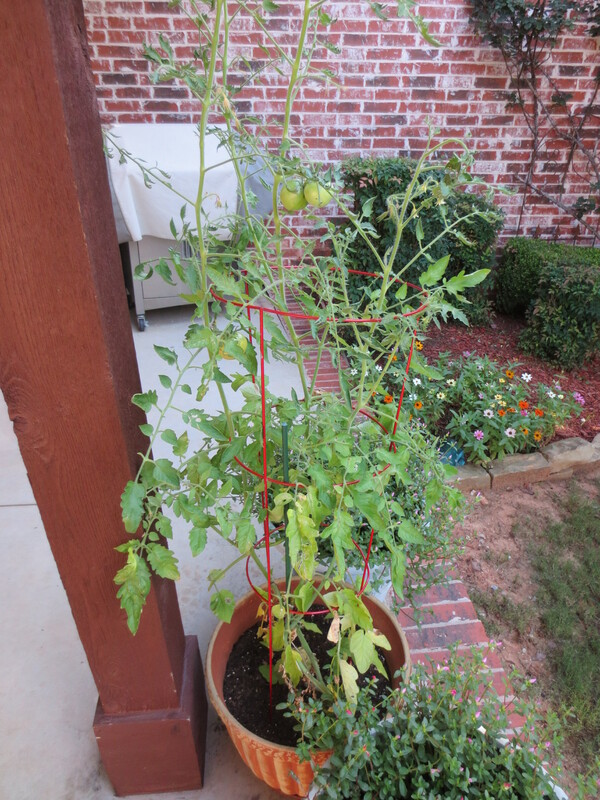 I am patiently awaiting the ripening of three more non-USDA certified, pesticide/herbicide-free ORGANIC suburban pot farmed tomatoes. I will not have enough fruit for a sauce.